Part of working on a platform is educative, this is a talk I gave back in July 2012 which has been edited to add some source material and work alone for the forum. The original foundation of Spiritualism was that Survival of the individual was proven beyond that which we call death. This was first proven on March 31st 1848 when the spirit of a murdered pedlar communicated with firstly the Fox family, or more correctly with the parents and two youngest children Kate and Maggie, then with a group of neighbours headed by a Mr Duesler. A unique event because 11 days later a lawyer turned journalist took witness statements from those present which were then published by the end of April 1848 in a pamphlet called “A REPORT OF THE MYSTERIOUS NOISES, HEARD IN THE HOUSE OF MR. JOHN D. FOX”,. You can find this here at Psypioneer http://www.iapsop.com/psypioneer/psypioneer_v1_n12_apr_2005.pdf. Critically this and other research has enabled us to clear up some errors which have been repeated through the popular versions of our history. These were caused by the embellishments made by Anne Leah Fox Fish Brown Underhill the eldest sister who was not present at Hydesville in her reminiscences' about the event. First given to Robert Dale Owen and published in 1859 in his book Footfalls on The Boundary of Another World ( https://archive.org/details/foot00fallsonboundowenrich ). These included the youngest sister asking the Spirit here Mr Splitfoot do as I do when there was no mention of Splitfoot and it was the eldest sister. and about their ages in Riddle of the records here http://www.iapsop.com/psypioneer/psypioneer_v4_n9_sep_2008.pdf . This can be read on the forum heregiven the psypioneer link is down https://www.spiritualismlink.com/t295-the-fox-sisters-riddle-of-the-records. The first of those last two articles also mentions the issue of the pedlar's name which is always quoted as Rosna. However, it is almost certain this should be Rasme as I discovered during extensive newspaper research from 1848 to 1853 you can see the details in my blog here http://spiritualistblog.wordpress.com/2012/08/21/the-hydesville-peddler/ . There was no deeper philosophical interpretation put upon this communication at that time. It was purely proof that all of us survived beyond death with our individual memories and personality. This was reconfirmed by subsequent communication both with the Fox Family and other, as they were called media. However, although these discoveries attracted the widespread attention of a range of people from different but predominantly Christian, religious denominations, it was likely to have become one of history’s curios had not Spirit decided to take a decisive step. After the Hydesville events the Fox family never moved back into the Cottage. At first they lived in the house of their sons David before the eldest sister Anne Leah Fox Fish arrived and took Kate back to Rochester with her, the Mother and Margaret followed them soon afterwards. In Rochester the rappings continued but the Fox sisters gathered a group of close supporters who believed in the truth of communication with Spirit. Their closest supporters were Isaac and Amy Post, two Quakers they had known in the past and some who were drawn in by the Hydesville events most notably Eliab Capron and George Willets. Indeed Kate was to move to Auburn to stay with the Capron family in 1849, in an attempt to stabilise her young life, one which was to be in vain because rappings also appeared in Auburn once she had moved. By November 1849 only Maggie, Anne Leah and the mother were in Rochester and they were holding regular circles to communicate with Spirit. At this stage Spirit made a very important request, that they make a public demonstration of their mediumship in Rochester challenging the attendees to make a full investigation of their claims. The events were widely reported and led to the Fox sisters setting off touring various citied arriving in mid 1850 at Barnums Hotel New York City (never to be confused with the entirely separate P T Barnums circus) . Here they conducted sittings and séances which convinced the citizens that Spirit was communicating. Their most notable supporter was Horace Greeley the editor of the New York Tribune which reported widely on the events in a manner which helped spread awareness of their integrity and the fact of communication with Spirit. Even though the events at Rochester drew many more adherents to this new belief including many very influential citizens these supporters still had their own basis of belief. The Posts were Quakers, Samuel Byron Brittan one of the foremost proponents of the fledgling movement was a Unitarian minister who had once been a follower of Andrew Jackson Davis. Davis himself had been a follower of the ideas of Swedenborgs New Church but had formulated his own Harmonial Philosophy Association. This simple phrase re affirmed the original concept of the communications at Hydesville and Rochester. Spirit had affirmed our continued existence and ther ability to communicate with us no more and no less. An alternative approach was followed by the Society for the Diffusion of Spiritual Knowledge also founded in 1854 but with a definite philosophy and leaning towards Christian Spiritualism. Kate Fox worked as a medium at their headquarters and Emma Hardinge Britten was choir master details can be found here http://spirithistory.iapsop.com/1854_society_for_diffusion_of_spiritual_knowledge.html and their weekly newsletter The Christian Spiritualist here http://www.iapsop.com/archive/materials/christian_spiritualist/ . However, by this stage Spiritualism was attracting great attention both in America and Europe. It attracted many adherents with numbers rapidly rising over the million. Books, magazines and newspapers were appearing with great rapidity and these would reflect a wide range of views. It became clear that there were many viewpoints about what Spiritualism meant. There was a group, including Samuel Byron Brittan, a Supreme Court Judge, John Edmonds and Andrew Jackson Davis who saw it as an entirely new revelation. Although each may have differences in their view of what should or should not be included in the creed they saw it as replacing and sweeping away the old for a new rationally based religion. Other Spiritualist’s saw it as a new element of Christianity, a revelation that was consistent with Biblical teachings and could be incorporated into their own form of Christian Worship. A further group, as indicated by the New England Spiritualists, clearly saw it as new information which could be included in any religion. This was not something which swept away old religious belief but the new revelation, life continued beyond death, could be shared with everyone. Indeed it was a simple, provable truth which should be open to every living person on Earth. Currently there are atheists who have accepted this proof and believe in survival even if not God, a visit to the Campaign for Philosophical Freedom run by Michael Roll will give a flavour of their thinking. I have left out another element, there were many people in Victorian times who were students of the esoteric and the occult. It was the era of Ghost Stories and occult societies. To them the continuation of life beyond death was an addition to those esoteric studies. Many of these people mingled freely with the other Spiritualists. Madam Blavatsky was to lead the first split off from Spiritualism to form a society more representative with these ideas The Theosophical Society (Emma Hardinge Britten was formerly a friend of Blavatsky and was a member of the founding committee of the Theosophists). However, on many occasions members of this and other societies often remained in the Spiritualist movement. It is against this backdrop that Spiritualism was to develop. The very first attempt at a national association in the USA attempted to remain focused upon the phenomena and the contact from Spirit. Founded in 1864 it ran until a fateful annual general meeting in 1872. As an organisation it never adopted principles to define what Spiritualism was but attempted to guide the development of the movement. In 1872 it finally split because its then President Victoria Woodhull propounded a direction incorporating socialist principles (she was the first person to publish an American version of the Communist Manifesto), women’s rights and free love. It would not be until the 1890’s that Spiritualism would seek to organise in the UK and the USA. In all that time the fundamental differences in the position of the varying groups of Spiritualists continued to exist. However by 1890 it was clear that the traditional Religious groups were not going to revise their theologies to incorporate the truth of life after death that Spiritualism’s mediums were proving. By and large they considered this as an evil act reflecting the influences of Satan and evil Spirits. Spiritualism was suffering from persecution and found itself unable to present a concerted rebuttal of these views. In America they organised in 1893 forming what was to become the National Spiritualist Association of Churches. Even long term opponents of organisation, like the famous medium Cora Scott Richmond, now spoke entirely in favour of organisation. Very soon after formation they adopted their first declaration of principles and registered formerly as a religion. In the UK the 1890’s saw the evolvement of the Spiritualist National Union of Great Britain which adopted the 7 principles which had progressively evolved through the work of Emma Hardinge Britten over several decades. They began to be mentioned by her, in their full form, in 1888 and were most famously recorded at an address laying the foundation stone for Oldham Spiritual Temple (see p 13 http://www.snu.org.uk/documents/pdf/SNU%20PIONEER%2001_01.pdf). The adoption of a formal statement of belief was a vital step in registering as a Religion and gaining charitable status. Even then the new organisations were the home of very different views about what Spiritualism was. The schism with a Christian viewpoint was to see separate organisations formed to represent the concepts of Christian Spiritualism. In the UK this occurred after a move by Sir Arthur Conan Doyle, a committed Spiritualist, to add an 8th Principle “The Christ Principle” to the SNU’s 7, failed narrowly. http://www.iapsop.com/psypioneer/psypioneer_v1_n7_nov_2004.pdf . A similar pathw as takem in the USA as Christian Spiritualitst formed their own organisations when the proposal to adopt a Christian Base for the National Spiritualist Association of Churches (NSAC) was rejected in convention. Interestingly the removal of all non white members of the NSAC on segregation grounds, in 1922, also saw teh formation of a rather dynamic new group of Churches often embracig a broad range of belief systems. A brief review can be found here http://www.readersandrootworkers.org/wiki/Category:Working_Within_the_Spiritualist_Tradition . This is not a bad version of the variations in Spiritualism either. The 1922 events and teh effect on those forced form the NSAC and the way their Churches developed is something i may well write about as I g\have considerable material. It also highlights the rather uncomfortable relationship betweem our Principles and the reality of our personal prejudices, or our toleration to fall within teh norms of society even when our moral position tells us it is wrong. The pioneering Spiritualists who were often heavily involved in the equality and anti slavery movement must, in Spirit, have been horrified. What we can see is that Spiritualism is now a Religion. It is still a matter of conjecture about whether it was meant to be one or just a philosophy of Spirit open to all. The problem with Religions is they tend to develop rules and theology. Spiritualism never had Ministers until the NSAC was formed indeed in the UK the SNU only introduced this status several decades after its foundation. Indeed it can be seen to be, possibly, many different religions. However my position about Modern Spiritualism is within the arena of the SNU and NSAC principles. Conceptually organisations can be of great benefit to any movement. They can help to educate, promote and form reliable standards. If they are run correctly they can encourage research, investigation and foster informed growth in the knowledge base of the movement. I suspect that it was this ideal that was behind the pioneers of Spiritualism both before organisation and immediately afterwards, when the movement encompassed many different views. Personally I see Spiritualism as a philosophy, the words we have received from Spirit can help us guide our lives. The teachings can lead us to endeavour to raise our standards of behaviour and try to be of service both to others and Spirit. Finally I see it as a religion because I believe in one unprovable being God, The Fatherhood of God but I look at this in a much broader way because in some way we are a part of the creator with a spark of that Spirit. Of course there are other things which need dealing with like the pedlar's pack a prize exhibit at Lily Dale. Sadly this was neither found in the original excavations, nor when the cottage was moved nor when the children found the bones in the foundations of the cottage. They appear as a chapter, written by PLOA Keeler in a book called Hydesville In History produced by Mercy Cadwallader in 1917 (https://archive.org/details/hydesvilleinhis00cadwgoog). Unfortunately this book based its history on Anne Leah's embellished version and seems to have become the basis for the NSAC's record of the history. Many very good researchers have hunted for proof to guarantee the provenance of the pack and none can be found. 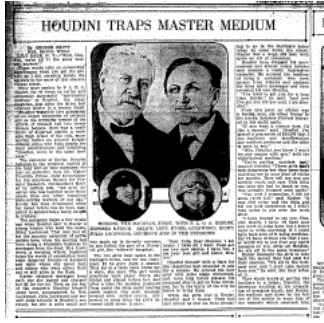 What makes it worse is that Keeler has admitted he was a fraud as a medium having been caught several times and most notably by Houdini. So there must be some considerable doubt about the real authenticity of the pack. This newspaper article is well worth a look with Marc Demarests comments. It indicates how the bname Charles Rasme was obtained for the Pedlar and is candid abourt Anne Leah Fox's absence of any mediumship ability. He just beat me to this wonderful find, fair dues for the hours he spends researching and the way he rescues the heritage of Spiritualists. The recalled events of long afterwards leave so many open doors to now unverifiable matters which probably didn't occur as said. Just like religion. I want to go back and read these prior Posts -- and more than once -- but my initial reaction is that Spiritualism provides something unique to every individual: something specific to that person's needs. If you wish to know whether life continues beyond the death of the physical body, and Spiritualism confirms for you that it does, and that's all you need from it: then that is sufficient. If having satisfied yourself in that respect you can return to your previous religious belief and practices, then that is what you needed. If Spiritualism becomes your religion, then it has likewise fulfilled your needs. I don't think that Spiritualism has to 'be' any particular overriding thing. It the individual gets from it what he wants and needs from it, that's what matters. There are many other threads here that could also be interesting, albeit ones that haven't been active in a while. I hope you'll stay and become a contributor, if only by asking a question. I apologise, with the decision of Garth Willey & his wife to close Woodlands Way and cease the web site the links to Psypioneer no longer work. IAPSOP is now hosting Psypioneer, sadly that changes at a time when Paul Gaunt had resigned as teh editor to concentrate on his health and the SNU's Pioneer magaxine. Leslie Price resumed editorship for a while seeking a replacement. Lis and I were thinking about this but the combination of our own commitments and Adelaide's remoteness from all the key source documents meant we could not decide in time to prevent the losure of this vital resource. Its a sad moment and I like to think something new could arise from this, not mainly UK based, in thr future if the mailing list remains. I now have a huge task in rebuilding all the psypioneer links throughout SpiritualismLink. And everyone: please take Mac's advice. We can always use new Threads, for sure: but don't forget that there are a lot of interesting older ones too that would make for interesting discussions, if resurrected. Thanks for sharing the great story here. Glad to know about spirituality.